I adore this card, for both its meaning and the collage process to create it. I have a heavy dose of French-Italian painter Frédéric Soulacroix’s work in my coins suit. There is a sleek elegance to his style and his paintings almost always feature a lavish and comfortable scene. These worked very well as a foundation for many of the coin cards. The thing I wanted to make more drastic in each collage were the faces. I wanted less cheerful faces to peer from behind the many masks used in the suit. Many of the cards aren’t dark, so I wanted the masquerade aspect of Halloween to play heavily in them. My queen is a strong woman. She’s the master of her domain. The mother to those around her who keeps a good home for them. The ruler over her working domain and practical keeper of her coins. And she does all of this with a simple grace and a level head. As the keeper of my home and my own business I identify with her quite well. There is a sometimes an intense balance that must be maintained to keep home and business both equally successful. It is far too easy to let time with a business take away from time that should be spent in the home and with family. Learning that type of balance doesn’t always happen over night. It took me two decades, but my reward was having a better home, my own independence in my business, and just enough extra to be generous with others where I can. In my card my queen relaxes with a book in the very comfortable world she has worked hard to create. She is surrounded by nature and those things she feels are her creature comforts. She is keeping an eye on her coin. In the theme of the Lydia deck she is a part of the last masquerade of summer that comes on the night of the autumn solstice. Her masked affair begins in those last green moments of summer and ends in the first changing colors of the start of autumn. She’s one of the prettiest cards in the deck. Next Article Next Article: It’s October!! Bethalynne Bajema is a life long artist and writer who works as art director for her family business The Attic Shoppe Trading Co. 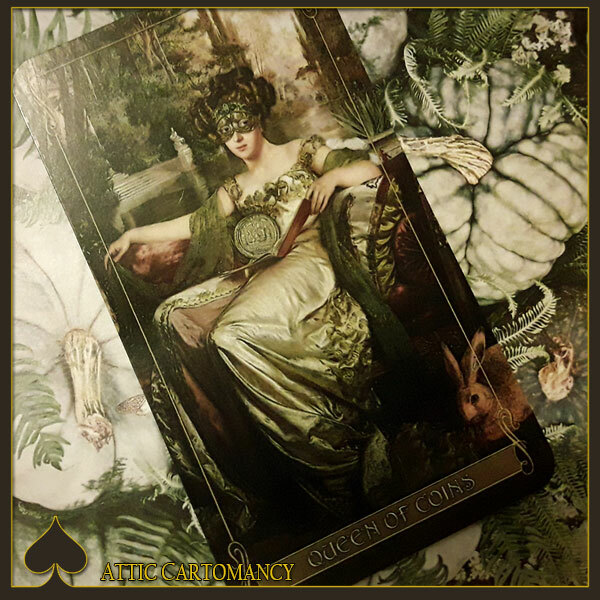 Among other projects, she's a prolific collectable card deck maker, adding tarot, lenormand and regular playing card decks to her portfolio over the past decade. When not working or taunting squirrels, you can follow her attempts to become a Practical Magic aunt on instagram or visit her online portfolio. Copyright © 2019 Bethalynne Bajema & Attic Cartomancy. All rights reserved. Please visit my other sites!